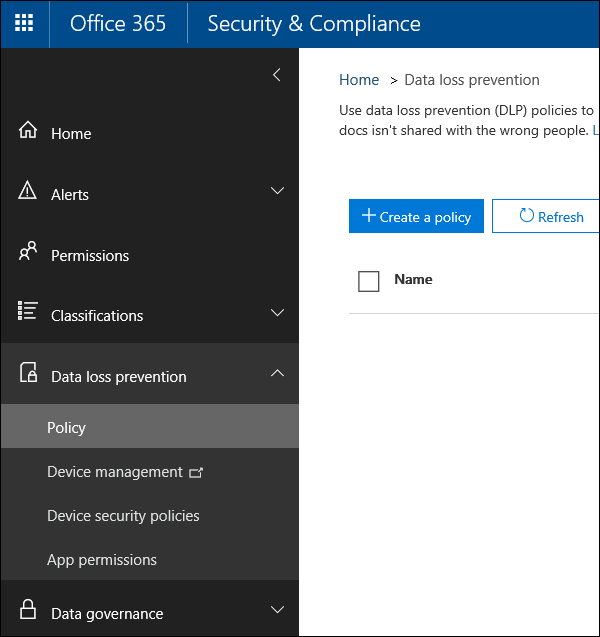 You can use a data loss prevention (DLP) policy to identify, monitor, and protect sensitive information across Office 365. You want people in your organization who work with this sensitive information to stay compliant with your DLP policies, but you don't want to block them unnecessarily from getting their work done. This is where email notifications and policy tips can help. 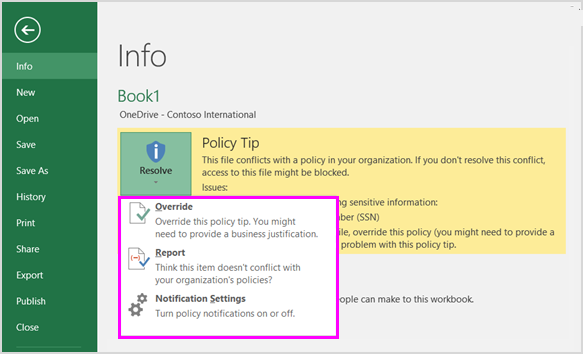 A policy tip is a notification or warning that appears when someone is working with content that conflicts with a DLP policy—for example, content like an Excel workbook on a OneDrive for Business site that contains personally identifiable information (PII) and is shared with an external user. You can use email notifications and policy tips to increase awareness and help educate people about your organization's policies. You can also give people the option to override the policy, so that they're not blocked if they have a valid business need or if the policy is detecting a false positive. Send an email notification to the people you choose that describes the issue. 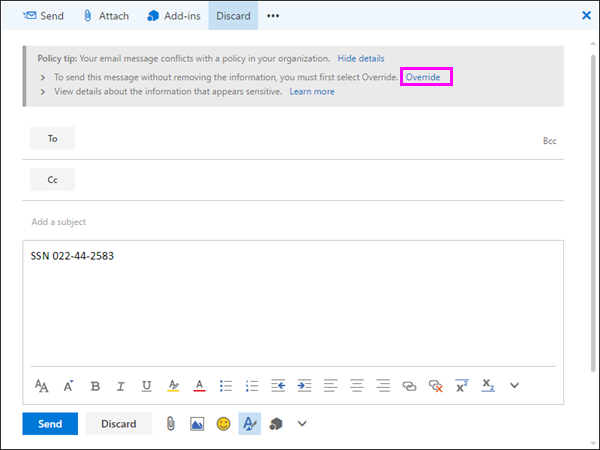 For email in Outlook on the web and Outlook 2013 and later, the policy tip appears at the top of a message above the recipients while the message is being composed. 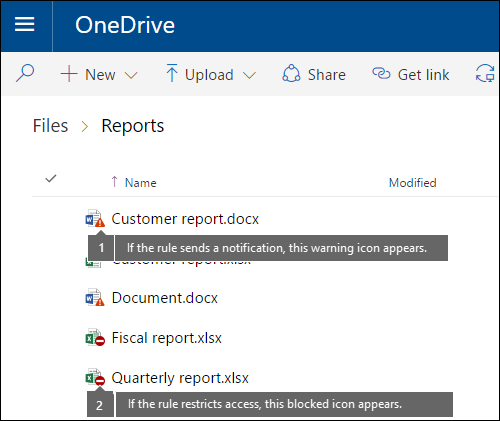 For documents in a OneDrive for Business account or SharePoint Online site, the policy tip is indicated by a warning icon that appears on the item. To view more information, you can select an item and then choose Information in the upper-right corner of the page to open the details pane. 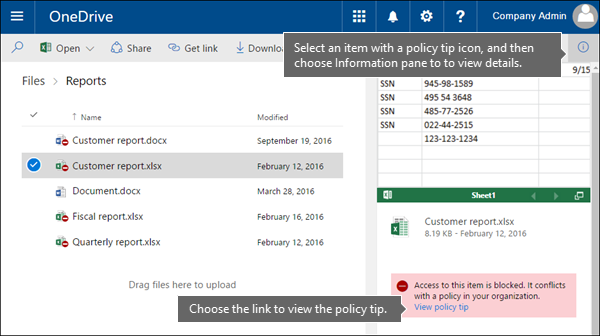 For Excel 2016, PowerPoint 2016, and Word 2016 documents that are stored on a OneDrive for Business site or SharePoint Online site that's included in the DLP policy, the policy tip appears on the Message Bar and the Backstage view ( File menu > Info). 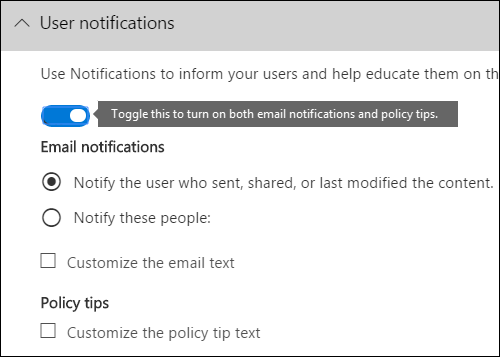 When you create a DLP policy, both email notifications and policy tips are part of the User notifications section. To start with an empty template, choose Custom > Custom policy > Next. Choose Let me choose specific locations > Next. 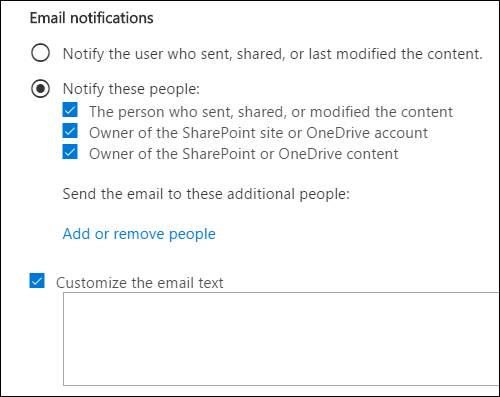 To include only specific SharePoint sites or OneDrive accounts, switch the Status to on, and then click the links under Include to choose specific sites or accounts. In the rule editor, under User notifications, switch the status on. Send the notification to the people you choose. These people can include the owner of the content, the person who last modified the content, the owner of the site where the content is stored, or a specific user. Customize the text that's included in the notification by using HTML or tokens. See the section below for more information. Email notifications can be sent only to individual recipients—not groups or distribution lists. Only new content will trigger an email notification. Editing existing content will trigger policy tips but not an email notification. Notifications have a Subject line that begins with the action taken, such as "Notification", "Message Blocked" for email, or "Access Blocked" for documents. 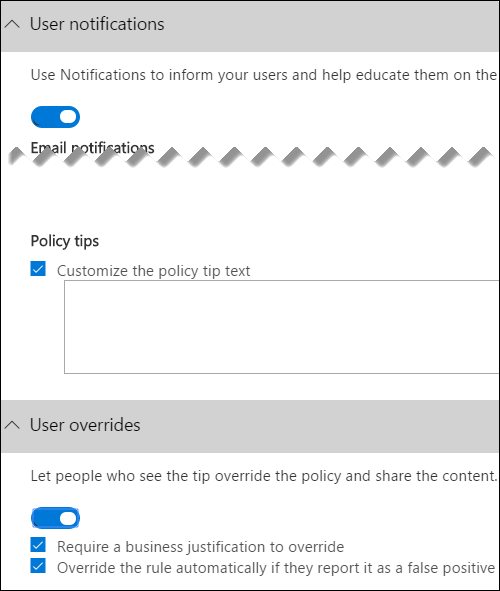 If the notification is about a document, the notification message body includes a link that takes you to the site where the document's stored and opens the policy tip for the document, where you can resolve any issues (see the section below about policy tips). If the notification is about a message, the notification includes as an attachment the message that matches a DLP policy. By default, notifications display text similar to the following for an item on a site. The notification text is configured separately for each rule, so the text that's displayed differs depending on which rule is matched. This item conflicts with a policy in your organization. Your email message conflicts with a policy in your organization. This item conflicts with a policy in your organization. If you don't resolve this conflict, access to this file might be blocked. Your email message conflicts with a policy in your organization. The message wasn't delivered to all recipients. This item conflicts with a policy in your organization. Access to this item is blocked for everyone except its owner, last modifier, and the primary site collection administrator. You can create a custom email notification instead of sending the default email notification to your end users or admins. The custom email notification supports HTML and has a 5,000-character limit. You can use HTML to include images, formatting, and other branding in the notification. You can also use the following tokens to help customize the email notification. These tokens are variables that are replaced by specific information in the notification that's sent. The actions applied to the content. The URL of the document on the SharePoint Online site or OneDrive for Business site. The conditions that were matched by the content. Use this token to inform people of possible issues with the content. Simply notify the person that the content conflicts with a DLP policy, so that they can take action to resolve the conflict. You can use the default text (see the tables below) or enter custom text about your organization's specific policies. Require the person to enter a business justification for overriding the policy. This information is logged and you can view it in the DLP reports in the Reports section of the Security & Compliance Center. Allow the person to report a false positive and override the DLP policy. This information is also logged for reporting, so that you can use false positives to fine tune your rules. 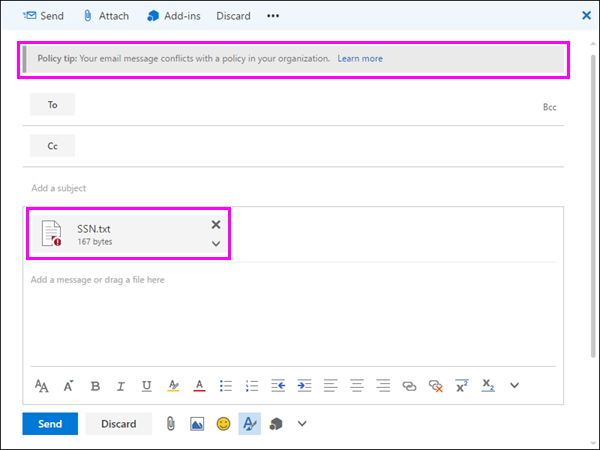 First rule: If fewer than five instances of this sensitive information are detected in a document, and the document is shared with people inside the organization, the Send a notification action displays a policy tip. For policy tips, no override options are necessary because this rule is simply notifying people and not blocking access. Second rule: If greater than five instances of this sensitive information are detected in a document, and the document is shared with people inside the organization, the Block access to content action restricts the permissions for the file, and the Send a notification action allows people to override the actions in this rule by providing a business justification. Your organization's business sometimes requires internal people to share PII data, and you don't want your DLP policy to block this work. Third rule: If greater than five instances of this sensitive information are detected in a document, and the document is shared with people outside the organization, the Block access to content action restricts the permissions for the file, and the Send a notification action does not allow people to override the actions in this rule because the information is shared externally. Under no circumstances should people in your organization be allowed to share PII data outside the organization. The option to override is per rule, and it overrides all of the actions in the rule (except sending a notification, which can't be overridden). It's possible for content to match several rules in a DLP policy, but only the policy tip from the most restrictive, highest-priority rule will be shown. For example, a policy tip from a rule that blocks access to content will be shown over a policy tip from a rule that simply sends a notification. This prevents people from seeing a cascade of policy tips. If the rule sends a notification about the file, the warning icon appears. If the rule blocks access to the document, the blocked icon appears. To take action on a document, you can select an item > choose Information in the upper-right corner of the page to open the details pane > View policy tip. 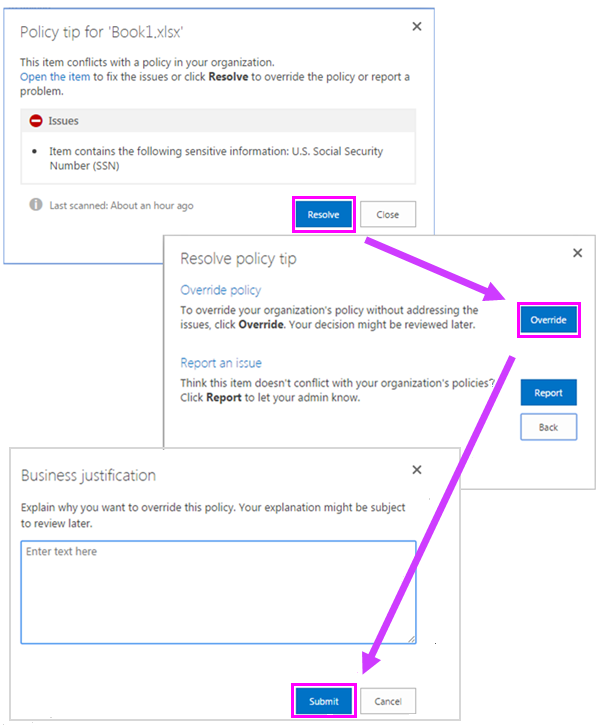 The policy tip lists the issues with the content, and if the policy tips are configured with these options, you can choose Resolve, and then Override the policy tip or Report a false positive. DLP policies are synced to sites and contented is evaluated against them periodically and asynchronously, so there may be a short delay between the time you create the DLP policy and the time you begin to see policy tips. There may be a similar delay from when you resolve or override a policy tip to when the icon on the document on the site goes away. By default, policy tips display text similar to the following for an item on a site. The notification text is configured separately for each rule, so the text that's displayed differs depending on which rule is matched. You can customize the text for policy tips separately from the email notification. Unlike custom text for email notifications (see above section), custom text for policy tips does not accept HTML or tokens. Instead, custom text for policy tips is plain text only with a 256-character limit. When you compose a new email in Outlook on the web and Outlook 2013 and later, you'll see a policy tip if you add content that matches a rule in a DLP policy, and that rule uses policy tips. The policy tip appears at the top of the message, above the recipients, while the message is being composed. Policy tips work whether the sensitive information appears in the message body, subject line, or even a message attachment as shown here. If the policy tips are configured to allow override, you can choose Show Details > Override > enter a business justification or report a false positive > Override. Note that when you add sensitive information to an email, there may be latency between when the sensitive information is added and when the policy tip appears. 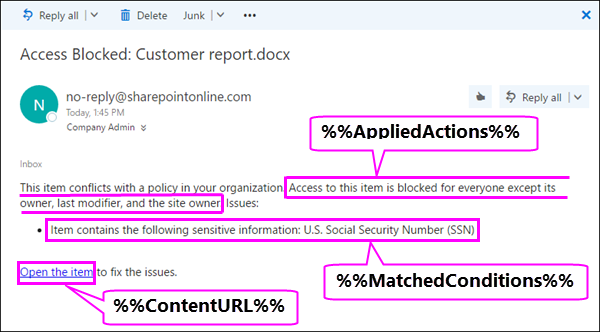 Note that all of these conditions work in Outlook, where they will match content and enforce protective actions on content. But showing policy tips to users is not yet supported. 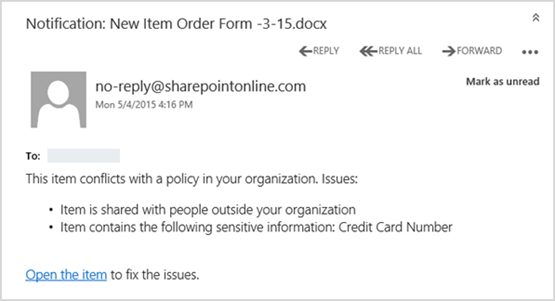 Policy tips can work either with DLP policies and mail flow rules created in the Exchange admin center, or with DLP policies created in the Office 365 Security & Compliance Center, but not both. This is because these policies are stored in different locations, but policy tips can draw only from a single location. If you've configured policy tips in the Exchange admin center, any policy tips that you configure in the Office 365 Security & Compliance Center won't appear to users in Outlook on the web and Outlook 2013 and later until you turn off the tips in the Exchange admin center. This ensures that your current Exchange mail flow rules (also known as transport rules) will continue to work until you choose to switch over to the Office 365 Security & Compliance Center. 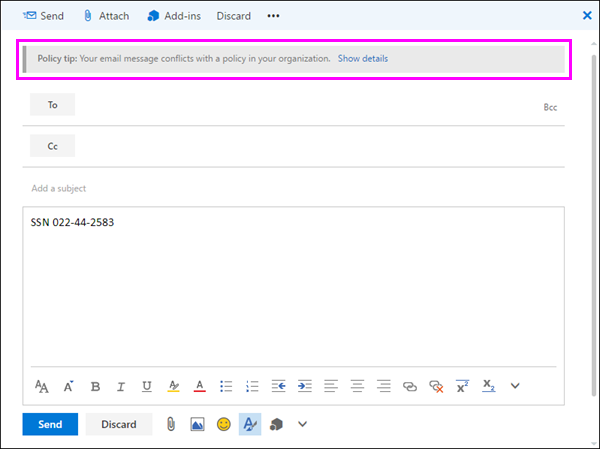 Note that while policy tips can draw only from a single location, email notifications are always sent, even if you're using DLP policies in both the Office 365 Security & Compliance Center and the Exchange admin center. By default, policy tips display text similar to the following for email. Your email conflicts with a policy in your organization. The Office document is stored on a OneDrive for Business site or SharePoint Online site. The site is included in a DLP policy that's configured to use policy tips. These Office 2016 desktop programs automatically sync DLP policies directly from Office 365, and then scan your documents to ensure that they don't conflict with your DLP policies and display policy tips in real time. Depending on how you configure the policy tips in the DLP policy, people can choose to simply ignore the policy tip, override the policy with or without a business justification, or report a false positive. Policy tips appear on the Message Bar. And policy tips also appear in the Backstage view (on the File tab). If policy tips in the DLP policy are configured with these options, you can choose Resolve to Override a policy tip or Report a false positive. In each of these Office 2016 desktop programs, people can choose to turn off policy tips. If turned off, policy tips that are simple notifications will not appear on the Message Bar or Backstage view (on the File tab). However, policy tips about blocking and overriding will still appear, and they will still receive the email notification. In addition, turning off policy tips does not exempt the document from any DLP policies that have been applied to it. By default, policy tips display text similar to the following on the Message Bar and Backstage view of an open document. The notification text is configured separately for each rule, so the text that's displayed differs depending on which rule is matched. This file conflicts with a policy in your organization. Go to the File menu for more information. This file conflicts with a policy in your organization. If you don't resolve this conflict, access to this file might be blocked. Go to the File menu for more information.